Five SHINING stars to Iriswoods! My husband and I got married here in May, and can I just tell you - our friends and family are STILL talking about our wedding! Babs is an absolute joy to work with, and she and her team went above and beyond to make sure our day was perfect. I literally cannot say enough good things about Iriswoods! 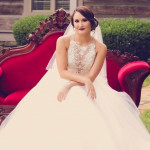 They handled all the details seamlessly, worked with us gracefully when we made some adjustments, and I literally did not have to worry about anything (and that's saying quite a lot, when you're the bride!) Doing the all-inclusive package was a lifesaver; and, every single aspect was perfection. If you're looking for an incredible venue for your wedding, please please use Iriswoods - you will be so happy you did!! I had my wedding at Iriswoods and it was absolutely amazing! Babs and her team went above and beyond to make our day everything we wanted and more! From day one she was so helpful and considerate. We were able to add and make adjustments to our package so that it fit our vision perfectly. I honestly couldn’t be happier with our experience and day! Iriswoods created the wedding of my dreams and I am so thankful for everything they did for us! You can’t go wrong with this venue! This place is amazing!!! The grounds are stunning and the staff is excellent! I loved being able to shoot there for a wedding!!! It’s a must see!! Review Iriswoods Wedding and Events Venue here!